Location: Saint-Léonard, in the Pas-de-Calais departement of France (Nord-Pas-de-Calais Region). Notes: Château de Pont-de-Briques is located in the municipality of Saint-Léonard in the Pas-de-Calais. It is near the place called "de-Bricks Bridge" which was the headquarters of Napoleon for the Boulogne Camp 1803-1805.Castle of-Bricks Bridge was built in 1640 for Louise Audegau then was changed to Antoine Aumont and Bernard Audegau. Louis Patras Campaigno had rebuilt the chapel and then did make major work by the architect Giraud Sannier 1786: raising the house and enlarge the wings. 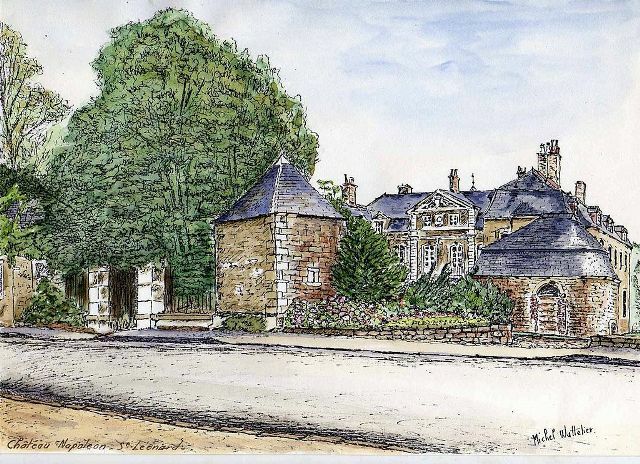 It was Napoleon's residence in 1803 and 1804 during the Boulogne camp. Castle of bricks-Pont was transformed into an orphanage in 1900, and the building built at that time was destroyed in 1974. Contemporary history of Pont-de-Briques Castle was chaotic: the expansion of economic and industrial needs of the city of Boulogne-sur-Mer led to decide by decree dated February 9, 1966, destruction this castle in favor of a new road. At the initiative of Fernand Beaucour, a safeguard society of this castle is established on 17 June 1966 leading to reconsider and finally cancel the prefect's decision to destroy this important historic site. Some time later, a deviation is decided by ministerial decree of 24 February 1969. The proceedings of the association will achieve the ranking of the castle as a historic monument by Ministerial Decree of 1 October 1974 .. So its preservation is acquired. Castle of bricks-Pont was bought and restored in 2000 by a real estate company that turned into apartments. The rooms occupied by Napoleon are rented by the Community of agglomeration of Boulogne to create a museum space dedicated to the history of the Camp de Boulogne and Napoleon's life in privacy.